The Mosquito and Vector Control Program protects public health by controlling mosquitoes and other vectors that spread disease. Mosquitoes, ticks, and rodents are not only a nuisance, but are a major threat to public health. This program controls disease vectors and nuisance pests using effective and environmentally sensitive methods, and reduce the risk of vector-borne diseases such as West Nile virus and plague. Learn more about the Mosquito & Vector Control Program by viewing the program brochure. A vector is any insect or arthropod, rodent or other animal of public health significance capable of harboring or transmitting the causative agents of human disease (such as West Nile virus and malaria). Under certain circumstance insects, arthropods and other animals capable of causing direct human injury or discomfort, but not disease, are sometimes referred to as vectors. What Vector Control District Am I In? Please visit http://westnile.ca.gov/ziplocator.php to find out what vector control district you are in. To view our vector control inspection reports, visit our EHS Customer Service Portal. Click on “View All Inspections” and search by city or facility name, and permit type (Poultry Ranch or Riding Academy). To receive links to our inspection reports by email, register for an account. As a registered user, you can receive notification emails when inspection reports for a specific facility are published. You will also have online access to follow-up information related to any complaints you submit. Inclusion is our mailing list is FREE and you can opt out at any time by clicking the “Unsubscribe” link in the footer of our e-mail messages. Q: What is a vector? A: San Bernardino County Code states that “‘Vector’ means any animal capable of transmitting the causative agent of human disease or capable of producing human discomfort or injury, including, but not limited to, mosquitoes, flies, fleas, ticks, mites, and rats, but not including any domesticated animal.” View What is a Vector? for more information. Q: Why is there a Vector Control benefit assessment on my tax bill? A: The annual assessment pays for vector control services provided in your community. These services include surveillance for diseases and control of insects and animals that can cause human illness. A: West Nile virus is a virus commonly found in Africa, West Asia and the Middle East. It is closely related to the virus that causes St. Louis encephalitis. West Nile virus can infect humans, birds, mosquitoes, horses and some other mammals. For more information visit WestNile.ca.gov or Centers for Disease Control West Nile Virus. View California Surveillance and Facts About West Nile Virus. Q: How do people get West Nile virus? A: West Nile virus is typically spread to humans by the bite of an infected mosquito. View California Surveillance and Facts About West Nile Virus. Q: What are the symptoms of West Nile virus? A: Most people who are bitten by a mosquito with West Nile virus will not get sick. Some individuals will experience headache, high fever and neck stiffness. In less than 1 percent of individuals, symptoms can be more severe, including coma, tremors, convulsions, muscle weakness and paralysis. View California Surveillance and Facts About West Nile Virus. Q: What can I do to protect myself from West Nile virus? A: Avoid activity outside when mosquitoes are most active, especially at dawn and dusk. When outdoors, wear long pants, long sleeve shirts and other protective clothing. Apply insect repellent according to label instructions. Make sure that doors and windows have tight fitting screens. Repair or replace screens that have tears or holes. Eliminate all sources of standing water that can support mosquito breeding. View California Surveillance and Facts About West Nile Virus. Q: Which mosquito repellent works best? A: The most effective repellents use DEET. Products containing DEET are safe when used according to label directions. These products have been approved by the federal Environmental Protection Agency after undergoing rigorous testing. View California Surveillance and Facts About West Nile Virus. Q: Does San Bernardino County Vector Control Program have an action plan when West Nile Virus reaches San Bernardino County? A: In the event that San Bernardino County or the California Department of Health Services declares emergency conditions, SBCVCP will take emergency control measures to prevent the spread of West Nile Virus (WNV) and other mosquito-borne diseases. View the 2003 Comprehensive West Nile Virus Surveillance and Control Plan. Q: What can I do to avoid a mosquito infestation on my property? A: There are many different types of mosquitoes in San Bernardino County and each of them needs standing water to complete its life cycle. You can protect yourself from mosquito bites and the diseases these insects carry (encephalitis and malaria) by eliminating water sources on your property. Keep roof gutters and drainage ditches clean, change bird baths and animal troughs every week, store boats upside down or cover them tightly, and store tires in a covered area. Also, if you have ornamental ponds and decorative pools, contact our office to find out where mosquito fish can be purchased in San Bernardino County. Call (909) 388-4600 for more information. View What is a Vector? for more information. Q: How can I discourage rats from nesting on my property? A: In San Bernardino County, the roof rat is the species which lives in our residential areas, mostly under piles of wood and debris, in garages, attics, and storage areas. Keep wood piles, lumber and household items neatly stacked at least 18 inches above the ground and away from walls and fences. Clean up and haul away junk and debris and trim trees, bushes, and vines at least four feet away from your roof. Pet food, fruit trees, open trash cans and vegetable gardens initially attract rats; then they find shelter. View What is a Vector? for more information. If your question has not been addressed here, complete the Online Complaint Form. Two invasive (non-native) mosquito species have recently been found in several California cities and there is a potential for them to spread into other areas of California. They are named Aedes aegypti (the yellow fever mosquito) and Aedes albopictus (the Asian tiger mosquito). Unlike most native mosquito species, Aedes aegypti and Aedes albopictus bite during the day. Both species are small black mosquitoes with white stripes on their back and on their legs. They can lay eggs in any small artificial or natural container that holds water. Visit the California Department of Public Health for more information about Aedes aegypti and Aedes albopictus mosquitoes. Zika virus is transmitted by Aedes aegypti mosquitoes (yellow fever mosquitoes) and Aedes albopictus mosquitoes (Asian tiger mosquitoes). These mosquitoes are not native to California. However, since 2011 they have been detected in several California counties. An Aedes mosquito can only transmit Zika virus after it bites a person who has this virus in their blood. Thus far in California, Zika virus infections have been documented only in people who were infected while traveling outside the United States or through sexual contact with an infected traveler. To date there has been no local mosquito-borne transmission of Zika virus in California. Zika virus is not spread through casual contact, but can be spread by infected persons to their sexual partners. Zika virus infection in pregnant women can cause birth defects and other poor pregnancy outcomes. Additionally, there is an association between Zika and Guillain-Barré Syndrome (GBS), a disease affecting the nervous system. Visit the California Department of Public Health for more information about Zika. Unmaintained pools grow algae and bacteria, causing the water to appear green, and become ideal habitats for mosquito development. Depressed housing markets and foreclosures have led to many neglected swimming pools in this County. One single neglected swimming pool can breed millions of mosquitoes that can infest entire neighborhoods, putting residents at risk for West Nile virus. What Can Vector Control Do? What Should I Do If Someone I Know Has A Neglected Swimming Pool? Call or text 1 (800) 442-2283 or file an online complaint to report the pool. DEHS’s Mosquito and Vector Control Program (MVCP) is offering FREE mosquito fish to all County residents within MVCP’s jurisdiction. These mosquito fish are to be used on private property to reduce the potential for mosquito breeding. One request may be made per year for each household. A valid form of California identification, a utility bill or other official document indicating residence is required to verify jurisdictional residence. Determine if you are within MVCP’s jurisdiction. To receive mosquito fish, visit the MVCP office during regular business hours at 248 South Sierra Way, Unit E, San Bernardino, CA 92415 and complete a Mosquito Fish Request form. NOTE: Distribution of mosquito fish is subject to availability. Learn more about mosquito fish. Help protect yourself and the community against West Nile Virus. Certain species of birds are very susceptible to West Nile virus and often die from it. Reporting dead birds and squirrels is a very helpful tool to our disease surveillance and monitoring efforts. The Mosquito and Vector Control Program and the California Department of Public Health use dead bird reports to help identify increased West Nile virus activity in an area. If you see a bird that has been dead for less than 24 hours, please call 1-877-WNV-BIRD (1-877-968-2473) or report it online. Q: How do people get infected with West Nile Virus (WNV)? A: The principal route of human infection with West Nile Virus is through the bite of an infected mosquito. Mosquitoes become infected when they feed on infected birds, which may circulate the virus in their blood for a few days. The virus eventually finds its way into the mosquito’s salivary glands. During subsequent blood meals, the virus may be injected into humans and animals, where it can multiply and possibly cause illness. Additional routes of infection have become apparent during the 2002 West Nile epidemic. It is important to note that these other methods of transmission represent a very small proportion of cases. A recent investigation has confirmed WNV transmission through transplanted organs. Investigations of other patients who developed WNV infection within several weeks of receiving blood products or organs are ongoing to determine whether WNV was transmitted by transfusion or transplantation in any of these cases. These is one reported case of trans-placental (mother-to-child) WNV transmission. although transmission of WNV and similar viruses to laboratory workers is not a new phenomenon, two recent cases of WNV infection of laboratory workers have been reported. Q: What are the West Nile Virus, West Nile Fever, and West Nile Encephalitis? A: West Nile Virus is a flavivirus commonly found in Africa, West Asia, and the middle East. It is closely related to St. Louis Encephalitis virus found in the United States. The virus can infect humans, birds, mosquitoes, horses, and some other mammals. West Nile Fever is a case of mild disease in people, characterized by flu-like symptoms. West Nile Fever typically lasts only a few days and does not appear to cause any long-term health effects. More severe disease due to a person being infected with this virus can be West Nile Encephalitis, West Nile Meningitis, or West Nile Meningoencephalitis. Encephalitis refers to an inflammations of the brain, Meningitis is an inflammation of the membrane around the brain and the spinal cord, and Meningoencephalitis refers to inflammation of the brain and the membrane surrounding it. A: West Nile Virus has been commonly found in humans and birds and other vertebrates in Africa, Eastern Europe, West Asia, and the Middle East, but until 1999 had not previously been documented in the Western Hemisphere. It is not known from where the U.S. virus originated, but it is most closely related genetically to strains found in the Middle East. Q: How long has West Nile Virus been in the U.S.? A: It is not known how long it has been in the U.S., but CDC scientists believe the virus has probably been in the eastern U.S. since the early summer of 1999, possibly longer. Q: What is the County Vector Control Program doing to address the problem of West Nile Virus? For West Nile Virus information updates call toll free: 877-WNV-BIRD (877-968-273). Q: What can be done to prevent outbreaks of West Nile Virus? A: Prevention and control of West Nile Virus and other arboviral diseases is most effectively accomplished through integrated vector management programs. The L.A. County West Vector Control District maintains such programs including: surveillance for West Nile Virus activity in mosquito vectors, birds, and sentinel chickenflocks; and the implementation of appropriate mosquito control measures to reduce mosquitopopulations. Q: Is there a human vaccine against West Nile Encephalitis? A: No, but several companies are working towards developing a vaccine. Q: What can I do to reduce my risk of becoming infected with West Nile Virus? A: Stay indoors at dawn, dusk, and in the early evening. Wear long-sleeved shirts and long pants whenever you are outdoors. Spray clothing with repellents containing permethrin or DEET since mosquitoes may bite through thin clothing. Apply insect repellent sparingly to exposed skin. An effective repellent will contain up to 35% DEET (N, N-diethyl-meta-toluamide). DEET in high concentrations (greater than 35%) provides no additional protection. Repellents may irritate the eyes and mouth, so avoid applying repellent to the hands of children. Whenever you use an insecticide or insect repellent, be sure to read and follow the manufacturer’s DIRECTIONS FOR USE, as printed on the product. Install or repair window and door screens so that mosquitoes cannot get indoors. Note: Vitamin B and “ultrasonic” devices are NOT effective in preventing mosquito bites. Q: Where can I get more information on mosquito repellents? A: Visit the American College of Physicians website: “Mosquitoes and mosquito repellents: A clinician’s guide” (Mark S. Fradin, MD. Annals of Internal Medicine. June 1, 1998; 128:931-940). You can also find information on insect repellents containing DEET at the Environmental Protection Agency (EPA) website. Another good source of information about pesticides and repellents is the National Pesticide Information Center, which also operates a toll-free information line: 1-800-858-7378 (check their website for hours). (Information on this page obtained from the Centers for Disease Control and Prevention). For West Nile Virus information updates call toll free: 877-WNV-BIRD (877-968-2473). Q: How can I eliminate mosquitos? Neglected or out-of-order swimming pools, hot tubs, ponds, or fountains. IMPORTANT: Adding chlorine will not prevent mosquito breeding. Pumps and filters must work properly to prevent breeding. Containers such as rain barrels, can, buckets, jars, flower pots, etc. Anything that will hold water for more than seven days. (Information on this page obtained from the Centers for Disease Control and Prevention). Q: Who is at risk for getting West Nile Encephalitis? A: All residents of areas where virus activity has been identified are at risk of getting West Nile Encephalitis; persons over 50 years of age have the highest risk of severe disease. Q: What are the symptoms of West Nile Encephalitis? A: Most infections are mild, and symptoms include fever, headache, and body aches, occasionally with skin rash and swollen lymph glands. More severe infection may be marked by headache, high fever, neck stiffness, stupor, disorientation, coma, tremors, convulsions, muscle weakness, paralysis, and, rarely, death. Q: What is the incubation period in humans (i.e., time from infection to onset of disease symptoms) for West Nile Encephalitis? Q: I think I have symptoms of West Nile Virus. What should I do? A: Contact your health care provider if you have concerns about your health. If you or your family members develop symptoms such as high fever, confusion, muscle weakness, and severe headaches, you should see your doctor immediately. Q: How do health care providers test for West Nile Virus? A: Your physician will first take a medical history to assess your risk for West Nile Virus. People who live in or traveled to areas where West Nile Virus activity has been identified are at risk of getting West Nile Encephalitis; persons older than 50 years of age have the highest risk of severe disease. If you are determined to be at high risk and have symptoms of West Nile Encephalitis, your provider will draw a blood sample and send it to a commercial or public health laboratory for confirmation. Q: How is West Nile Encephalitis treated? A: There is no specific therapy. In more severe cases, intensive supportive therapy is indicated, often involving hospitalization, intravenous fluids, airway management, respiratory support (ventilator), prevention of secondary infections (pneumonia, urinary tract, etc. ), and good nursing care. (Information on this page obtained from the Centers for Disease Control and Prevention). For West Nile Virus information updates call toll free: 877-WNV-BIRD (877-968-2473). Q: What is the basic transmission cycle? A: Mosquitoes become infected when they feed on infected birds, which may circulate the virus in their blood for a few days. 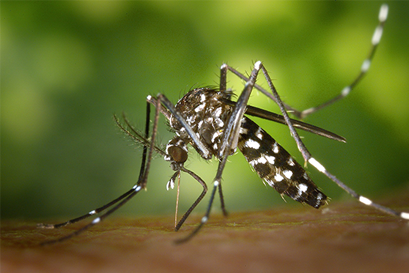 Infected mosquitoes can then transmit West Nile Virus to humans and animals while biting to take blood. The virus is located in the mosquito’s salivary glands. During blood feeding, the virus may be injected into the animal or human, where it may multiply, possibly causing illness. Q: If I live in an area where birds or mosquitoes with West Nile Virus have been reported and a mosquito bites me, and I likely to get sick? A: No. Even in areas where the virus is circulating, very few mosquitoes are infected with the virus. Even if the mosquito is infected, less than one percent of people who get bitten and become infected will get severely ill. The chances you will become severely ill from any on mosquito bite are extremely small. Q: Can you get West Nile Encephalitis from another person? A: No. West Nile Encephalitis is NOT transmitted from person-to-person. For example, you cannot get West Nile Virus from touching or kissing a person who has the disease, or from a health care worker who has treated someone with the disease. Q: Is a woman’s pregnancy at risk if she gets West Nile Encephalitis? A: There is one documented case of trans-placental (mother-to-child) transmission of WNV in humans. Although the newborn in this case was infected with WNV at birth and had severe medical problems, it is unknown whether the WNV infection itself caused these problems or whether they were coincidental. More research will be needed to improve our understanding of the relationship-if any-between WNV infection and adverse birth outcomes. Nevertheless, pregnant women should take precautions to reduce their risk for WMV and other arboviral infections by avoiding mosquitoes, using protective clothing and repellents containing DEET. When WNV transmission is occurring in an area, pregnant women who become ill should see their health care provider. Those whose illness is consistent with acute WNV infection should undergo appropriate diagnostic testing. For more details regarding the case described above, please see Centers for Disease Control and Prevention (CDC) MMWR Dec. 20, 2002. Q: Is West Nile Virus (WNV) transmitted by blood transfusion or organ donation? A: A recent investigation has identified transplanted organs as the source of WNV infection in four recipients or organs from a single donor. How the organ donor became infected is unknown. The organ donor might have become infected from a mosquito bite or possible acquired the infection through transfusion; an investigation of the numerous transfusions received by the organ donor is ongoing. Since the report of these cases, the Centers for Disease Control and Prevention (CDC) has been informed of other patients who developed WNV infection within several weeks of receiving blood products or organs. Investigations are ongoing to determine whether WNV was transmitted by transfusion or transplantation in any of these cases. Q: Besides mosquitoes, can you get West Nile Virus directly from other insects or ticks? A: Infected mosquitoes are the primary source for West Nile Virus. Although ticks infected with West Nile Virus have been found in Asian and Africa, their role in the transmission and maintenance of the virus is uncertain. However, there is no information to suggest that ticks played any role in the cases identified in the United States. Q: How many types of animals have been found to be infected with West Nile Virus? A: Although the vast majority of infections have been identified in birds, WNV has been shown to infect horses, cats, bats, chipmunks, skunks, squirrels, and domestic rabbits. Q: How does West Nile Virus actually cause severe illness and death in humans? A: Following transmission by an infected mosquito, West Nile Virus multiplies in the person’s blood system and crosses the blood-brain barrier to reach the brain. The virus interferes with normal central nervous system functioning and causes inflammation of brain tissue. Q: What proportion of people with severe illness due to West Nile Virus die? A: Among those with severe illness due to West Nile Virus, case-fatality rates range from three percent to 15% and are highest among the elderly. Less than one percent of persons infected with West Nile Virus will develop severe illness. Q: If a person contracts West Nile Virus, does that person develop a natural immunity to future infection by the virus? A: It is assumed that immunity will be lifelong. However, it may wane in later years. (Information on this page obtained from the Centers for Disease Control and Prevention). For West Nile Virus information updates call toll free: 877-WNV-BIRD (877-968-2473). Q: Do birds infected with West Nile Virus die or become ill? A: In the 1999 New York area epidemic, there was a large die-off of American crows. West Nile Virus has been identified in more than 70 species of birds found dead in the United States. Most of these birds were identified through reporting of dead birds by the public. Q: Can you get West Nile Virus directly from birds? A: There is no evidence that a person can get the virus from handling live or dead infected birds. However, persons should avoid barehanded contact when handling any dead animals and use or double plastic bags to place the carcass in a garbage can. Q: How can I report a sighting of dead bird(s) in my area? A: If you find a dead bird, particularly a crow or other corvid (e.g., jay, magpie, raven, etc. ), please call the number below promptly. The bird must be dead no more than 24 hours to enable testing for West Nile Virus. Do not touch the bird. Department of Health Services will record all dead bird reports and will arrange for pickup and laboratory testing for West Nile Virus when appropriate. (Information on this page obtained from the Centers for Disease Control and Prevention). For West Nile Virus information updates call toll free: 877-WNV-BIRD (877-968-2473). Q: Can West Nile Virus cause illness in dogs or cats? A: There is a published report of West Nile Virus isolated from a dog in southern Africa (Botswana) in 1982. West Nile Virus has been isolated from several dead cats in 1999 and 2000. A serosurvey of dogs and cats in the epidemic area showed a low infection rate. Q: Can infected dogs or cats be carriers (i.e., reservoirs) for West Nile Virus and transmit the virus to humans? A: West Nile Virus is transmitted by infectious mosquitoes. There is no documented evidence of person-to-person, animal-to-animal, or animal-to-person transmission of West Nile Virus. Veterinarians should take normal infection control precautions when caring for an animal suspected to have this or any viral infection. Q: How do dogs or cats become infected with West Nile Virus? A: The same way humans become infected — by the bite of infectious mosquitoes. The virus is located in the mosquito’s salivary glands. During blood feeding, the virus then multiplies and may cause illness. Mosquitoes become infected when they feed on infected birds, which may circulate the virus in their blood for a few days. It is possible that dogs and cats could become infected by eating dead infected animals such as birds, but this is unproven. Q: Can a dog or cat infected with West Nile Virus infect other dogs or cats? A: No. there is no documented evidence that West Nile Virus is transmitted from animal to animal. Q: How long can a dog or cat be infected with West Nile Virus? A: The answer is not known at this time. Q: Should a dog or cat infected with West Nile Virus be destroyed? What is the treatment for an animal infected with West Nile Virus? A: No. There is no reason to destroy an animal just because it has been infected with West Nile Virus. Full recovery from the infection is likely. Treatment would be supportive and consistent with standard veterinary practices for animals infected with a viral agent. (Information on this page obtained from the Centers for Disease Control and Prevention). For West Nile Virus information updates call toll free: 877-WNV-BIRD (877-968-2473). Q: Has West Nile Virus caused severe illness or death in horses? A: Yes, while data suggest that most horses infected with West Nile Virus recover, results of investigations indicate that West Nile Virus has caused deaths in horses in the United States. Q: Can I get infected with West Nile Virus by caring for an infected horse? A: West Nile Virus is transmitted by infectious mosquitoes. These is no documented evidence of person-to-person or animal-to-person transmission of West Nile Virus. Normal veterinary infection control precautions should be followed when caring for a horse suspected to have this or any viral infection. Q: How do the horses become infected with West Nile Virus? A: The same way humans become infected—by the bite of infectious mosquitoes. The virus is located in the mosquito’s salivary glands. When mosquitoes bite or “feed” on the horse, the virus is injected into its blood system. The virus then multiplies and may cause illness. The mosquitoes become infected when they feed on infected birds or other animals. Q: How does the virus cause severe illness or death in horses? A: Following transmission by an infected mosquito, West Nile Virus multiplies in the horse’s blood system, crosses the blood brain barrier, and infects the brain. The virus interferes with normal central nervous system functioning and causes inflammation of the brain. Q: Can a horse infected with West Nile Virus infect horses in neighboring stalls? A: No. There is no documented evidence that West Nile Virus is transmitted between horses. However, horses with suspected West Nile Virus should be isolated from mosquito bites, if at all possible. Q: My horse is vaccinated against Eastern Equine Encephalitis (EEE), Western Equine Encephalitis (WEE), and Venezuelan Equine Encephalitis (VEE). Will these vaccines protect my horse against West Nile Virus infection? A: No. EEE, WEE, and VEE belong to another family of viruses for which there is no cross-protection. Q: Can I vaccinated my horse against West Nile Virus infection? A: A West Nile Virus vaccine for horses was recently approved, but its effectiveness is unknown. Q: How long will a horse infected with West Nile Virus be infectious? A: We do not know if an infected horse can be infectious (i.e., cause mosquitoes feeding on it to become infected). However, previously published data suggest that the virus is detectable in the blood for only a few days. Q: What is the treatment for a horse infected with West Nile Virus? Should it be destroyed? A: There is no reason to destroy a horse just because it has been infected with West Nile Virus. Data suggest that most horses recover from the infection. Treatment would be supportive and consistent with standard veterinary practices for animals infected with a viral agent. Q: Where can I get more information on horses and West Nile Virus? A: Visit the USDA website Animal and Plant Health Inspection Service (APHIS). (Information on this page obtained from the Centers for Disease Control and Prevention). For West Nile Virus information updates call toll free: 877-WNV-BIRD (877-968-2473).